for vision software, hardware and system developers. View our Customers and Partners who endorse the reVISION Stack. Hundreds of Xilinx’s Embedded Vision customers target Zynq® SoCs and MPSoCs in addition to FPGAs. To address the challenges mentioned above, Xilinx provides the reVISION stack which includes a broad range of development resources for platform, algorithm and application development. This includes support for the most popular neural networks, including AlexNet, GoogLeNet, SqueezeNet, SSD, and FCN, the functional elements required to build custom neural networks (CNN/DNN), and leverage pre-defined and optimized CNN implementations for network layers. This is complemented by a broad set of acceleration-ready OpenCV functions for computer vision processing. For application level development, Xilinx supports popular frameworks including Caffe for machine learning and OpenVX for computer vision (to be released in second half 2017). The reVISION stack also includes development platforms from Xilinx and ecosystem partners based on Zynq SoCs and MPSoCs. The reVISION stack enables design teams without deep hardware expertise to use a software defined development flow to combine efficient implementations of machine learning and computer vision algorithms into highly responsive systems. The reVISION flow starts with a familiar, eclipse-based environment using C, C++ and/or OpenCL languages and associated compiler technology; this is called the SDSoC environment. 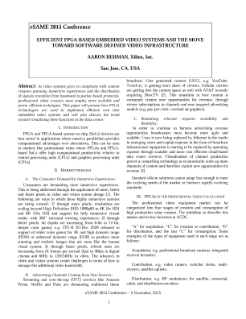 Within the SDSoC environment, software and systems engineers can target reVISION hardware platforms, and draw from a pool of acceleration-ready computer vision libraries, and/or the OpenVX framework (late Summer 2017), to quickly build new applications. For machine learning, popular frameworks like Caffe are used to train a neural network. 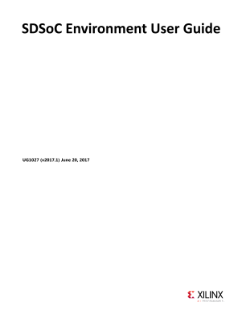 The Caffe generated .prototxt file is run on an ARM® based scheduler that drives inference processing on pre-optimized implementations of CNN network layers. 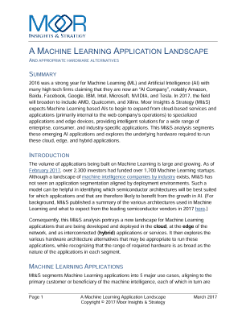 Expert Xilinx users deploying traditional RTL-based design flows, working with ARM based software developers, spent considerable design time creating highly differentiated machine learning and computer vision applications. To further speed design time and reduce the reliance on hardware experts, Xilinx introduced the SDSoC Development Environment, based on C, C++ and OpenCL. While this significantly reduces development cycles, it is not domain specific for Embedded Vision. Xilinx’s new reVISION stack enables a much broader set of software and systems engineers, with little or no hardware design expertise, to develop intelligent Embedded Vision systems easier and faster. Get started today designing your computer vision system around Zynq SoCs/MPSoCs and FPGAs by leveraging existing Xilinx and ecosystem design hardware, modules and production-ready Systems on Module (SOMs). Join the discussion on Xilinx forums. 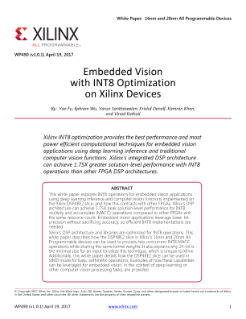 Introducing Xilinx’s all new library for computer vision, xfOpenCV , accelerating the most critical OpenCV functions. xfOpenCV will allow you to easily compose and accelerate computer vision functions in the FPGA fabric through SDx or HLx environments. In addition, xfOpenCV library is consistent with OpenCV and are optimized for performance, resource utilization and ease of use. xfOpenCV is available to the public on github. OpenCV library functions are essential to developing many computer vision applications. Xilinx’s xfOpenCV for computer vision, based on key OpenCV functions, will allow you to easily compose and accelerate computer vision functions in the FPGA fabric through SDx or HLx environments. In addition, xfOpenCV library functions are consistent with OpenCV and are optimized for performance, resource utilization and ease of use. Machine learning and deep learning have gained attention from the development community as a technique that provides enhanced intelligence to many applications including Embedded Vision. While not a new discipline, relatively new breakthroughs in algorithms, access to large data sets for algorithm training and efficient and economically more viable computing platforms have resulted in very rapid interest and adoption of the technology. Xilinx’s Zynq SoCs/MPSoCs are an ideal fit for machine learning, achieving 6X better images/sec/Watt in machine learning inference relative to embedded GPUs and typical SoCs. Xilinx’s reVISION Stack removes traditional design barriers by allowing you to quickly take a trained network and deploy it on Zynq SoCs and MPSoCs for inference. With the tight integration with Deephi ML IP/libraries in SDSoC, reVISION takes a leap forward towards higher productivity. Full software stack for deploying machine learning applications such as classification, detection, tracking and segmentation etc. Hardware optimized, and supported commonly used layers include: Conv, Dilated conv, Deconv, Depthwise Conv, ReLU/Leaky Relu/Relu6, Max/Ave Pooling, FC, Element wise, Concat, Batch normalization, Upsampling, Split, Reorg, Resize, SoftMax, Sigmoid etc. Please download DNNDK and board images from http://www.deephi.com/technology/dnndk. The AI revolution has accelerated the development and evolution of sensor technologies across numerous categories. It has also resulted in a mandate for a new level of sensor fusion, combining multiple types of sensors in different combinations to create a full and complete view of the system’s environment and objects in that environment. Whatever sensor configuration is specified today, or implemented tomorrow, needs to be ‘future proofed’ through hardware reconfigurability. Only Xilinx programmable devices offer this level of reconfigurability.